This travel tip / story comes to you from the “Artists Abroad Trip” of summer ’13. I was traveling with two friends–Aaron and Corey–on an extremely budgeted trip around the world. We were planning to give it a shot in France, but with the way we were treated by the local population in Montpellier we made a unanimous decision to make it to Switzerland as fast as possible and try from there. 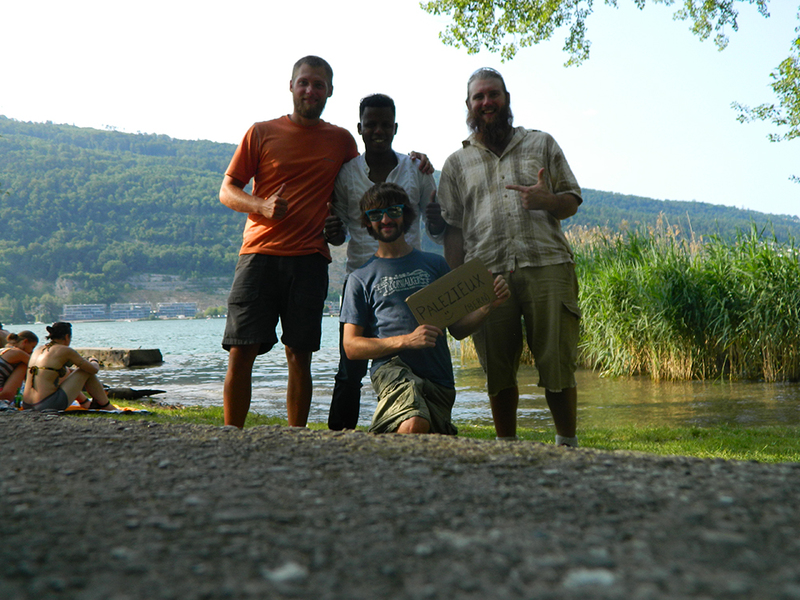 It was there, in Geneva, that we were first informed that hitchhiking was illegal in Switzerland, albeit possible. I went into an information center to inquire about bus routes and was telling the girl of our plans. She basically said that yes, it was illegal, but if we “play dumb” if confronted by police, we should be fine. She also mentioned that people are usually fine with it. The bad news was that we weren’t going to find a ride out of Geneva, which is a heavily-touristed, expensive and classy town. So we booked a train ticket to Montreux and decided to start our thumbing endeavor there. Long story short, we ended up being kind of stuck in Montreux for a couple of days, and camped outside of town to do laundry and such, and prepare for what we thought would be a lot of short rides, hiking along the road all day, and camping in the cold at night. To be honest, we had literally no idea what to realistically expect. Our third day in Montreux we woke up and went to a supermarket, bought three days-worth of food and took a “free” bus (The quotations are explained here) to the top of town by the highway, and set our backpacks down in front of a gas station. I walked around back to the dumpster (classy, I know) and grabbed some cardboard and we wrote “Bern” on it; the town we were intending to eventually reach, as well as a smiley faces and some music notes. We figured Bern would be possible in two or three days. 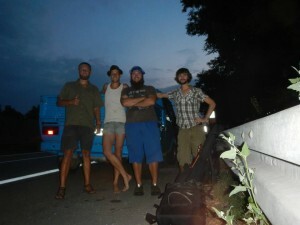 Once again I’ll reiterate how utterly clueless we were to actually go about hitchhiking. We had gotten some advice from our German friends in the hostel back in Barcelona, to either sit at a gas station or an on-ramp; and they were the ones who had told us to make a sign. We had no idea really where to sit, and we walked back and forth around the on-ramp area for a little while before finally settling down. I got out the guitar and started playing while Corey held the sign and dancing around smiling. We waved at the passing cars, which generated laughs and waves back, some people raising their shoulders as if to say “sorry, can’t do it today” with a smile. There were very few unhappy stares, which was a good omen. This proved to be true, because we had only been there for about 20 minutes when an Audi hatch-back hopped up onto the curb and motioned us over. We all jumped up, grabbed our packs and other things and ran over, piling everything in the back. I volunteered to sit shotgun, and jumped into the front seat. The first thing I thought to ask was “Parlez vous English?” which was answered with a quick shrug of the shoulders and “No, no English.” Well… this should be interesting. During introductions, and many hand-gestures and small words, we learned that our gracious driver was named Wilson, who had moved to Switzerland from The Dominican Republic. It turned out he could speak more English than he initially let on, but it was a very limited vocabulary; and more often than not many communications went on misunderstood. One very notable mis-communication was when we had been driving for the better part of an hour and he said to me: “I….money,” as he made the motion of sliding money into his pocket, “We go my house, you douche (the french word for ‘shower’), eat?” I gathered that this meant we could give him money and he would do the aforementioned things. After four days without a shower, and nothing but tuna and rice, it sounded like a good deal to me. “Sure!” I said back to him, and he nodded his head and kept driving. So now I was very confused. I was sure he had said for me to pay him money. Aaron and Corey had been asleep this entire time in the back seat and were just now waking up. I filled them in as we were making our way to Wilson’s house. When we pulled in, there was another car waiting in the driveway and Wilson said to me “Make money..” and pointed to the man getting out. A quick exchange between the two made me realize that he was getting money from the other guy, and had been talking about that, and not about money from us. My faith in humanity was restored, and we all sat for a minute playing over what had happened over the last 24 hours. We camped in the woods outside Biel that night, and the next day took a bus and then hiked to another on-ramp. We sat out for 15 minutes before a woman stopped and picked us up. From there she took us all the way into Freiburg, Germany, almost an hour out of her way, despite us telling her not to; that we could find another ride the rest of the way. After staying in Freiburg for three days, we hiked again to another on-ramp, this time just setting our packs on the ground as a car pulled up. A young woman took us from there about an hour up the autobahn, and from there we caught a ride with a young German farmer driving a retro-VW van/truck to Heidelberg. If you go to Europe, and you have at least one more person with you, hitchhike. Even if you have money. 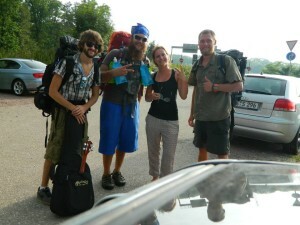 We met so many awesome people because of our hitchhiking that we would have never met otherwise. We were given advice about travel through their country, many laughs and good conversation with those who spoke English. It is incredibly humbling to see such good-nature still alive in humanity, and to those who picked us up and took us where we needed to go, or even partway there: Thank you. • Make a sign that says where you want to go, even if it’s far away. • Don’t get discouraged. If you don’t get a ride at first, keep those smiles going. Someone will stop, and if not, there’s always tomorrow! • I wouldn’t recommend hitchhiking alone. Although everyone who has picked us up so far has been incredibly nice and good-natured, you never know about people and you shouldn’t put yourself in a position to be taken advantage of. • Don’t make your driver feel uncomfortable. If you are a man who is getting a ride from a pretty woman, be respectful of her! She picked you up to help you out, not get hit on. Be respectful of your driver’s culture, and them as a person. If they like you, they will go out of their way to take you where you need to go! Have you hitchhiked before? Do you have any questions or advice you’d like to offer readers? Leave them in a comment below or visit me on Facebook! Only other thing i’ve found is if you can’t speak the language at least learn how to say do you speak English in theirs and as many words as possible. *I’ve had people swear they did not speak English until I made a fool of my self trying then they were miraculously fluent. THey may simple mean t5hey are not egotistic and it’s not really their first language. Lots of fun things can happen with mistranslations! I actually think it’s pretty great when people hitch their way all over the place, but it’s definitely a different style of travel, and you need to plan on going a lot slower, and expect things to go…oddly. It sure is more fun than sitting on a bus for 12 hours, though. That has got to be the very worst part of traveling. That would be fine, as long as you provide the credit and sources you mentioned, with a link to our site. We appreciate the networking! 🙂 what is your site?